One privilege of living in Nairobi is that there are a lot of great day trips that you can take from the city. Lake Naivasha, Mount Longonot, Lake Nakuru National Park, the Ngong Hills, heck, even Mombasa and the beautiful beach along Diani. They are easy to do: just charter a friendly taxi driver, and off you go. We’ve now done a lot of these trips, and it’s great: often, you don’t have to go far in Africa to see Africa. 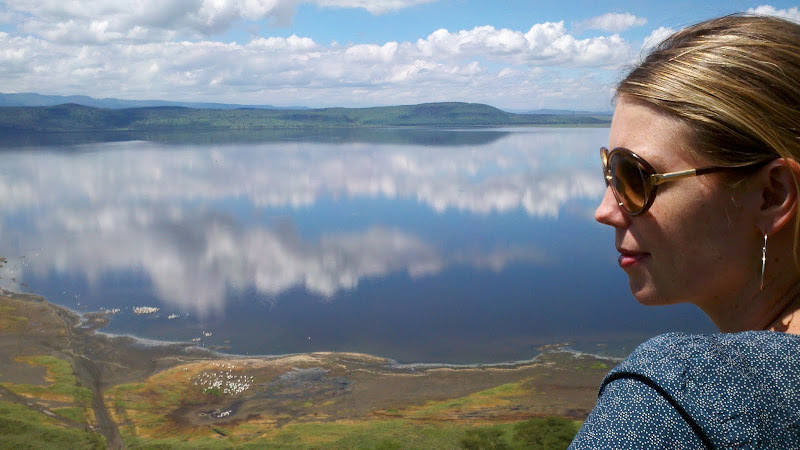 Lake Nakuru National Park was the first day trip that we made. As you can see from the bored expression on Page’s face, Nakuru is just not that pretty. It was pretty terrible. Not much to recommend it: everyone has seen flocks of tens of thousands of flamingos, chillin’, rhinos that you can basically walk right up to you and touch (though we did not), and tons of other animals that check you out and would probably like to ride with you in your car. So, we heartily dis-recommend the ho hum, not-beautiful, totally not incredibly stunning Nakuru National Park, a mere 2.5 hours away from Nairobi by car. If you are in Nairobi for a few days (doing something like visiting us), be sure to give this a “miss.” Or… the opposite of that. See all the Lake Nakuru National Park photos over at the photo depot.